Map and Reduce functions can be traced all the way back to functional programming languages such as Haskell and its Polymorphic Map function known as fmap. Even before fmap there was the Haskell map command used primarily for processing against lists. I am sure there are experts out there on the very long history of MapReduce who could provide all sorts of interesting information on that topic and the influences of both Map and Reduce functions in programming. However, the purpose of this article is to discuss effective strategies for performing highly parallel map reductions in the C# programming language. There are many large-scale packages out there for performing map reductions of just about any size. Google’s MapReduce and Apache’s Hadoop platforms are two of the most well known. However, there are many competitors in this space. Here are just a few references. MapReduce concepts are claimed to be around 25 years old by some. Strangely enough, the patent for MapReduce is currently held by Google and was only issued during 2004. Google says that MapReduce was developed for “processing large amounts of raw data, for example, crawled documents or web request logs”. 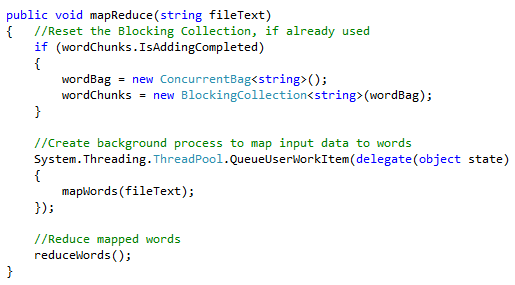 Blocking Collections – Blocking Collections are members of the System.Collections.Concurrent namespace and provide a centralized, thread safe location for multiple threads to add and remove objects during processing. These collections can be implemented using concurrent bag (not ordered), stack (LIFO), or queue (FIFO) collections. Thread safe versions of each collection are provided within the System.Collections.Concurrent namespace. Once the Blocking Collection has been wrapped around the appropriate bag, stack, or queue, it will manage timing differences between various producers and consumers using the collection. When the collection is empty it can block until new items are added or stop processing once all items have been processed and the collection is marked as complete. Technically a mapping function’s output should be a key-value pair. The key-value pair typically contains some form of key and associated numeric value that are both used during the reduction process. In many cases, the key will only be contained one time within the final reduction results. The values for each duplicate key encountered during mapping will be “reduced” by either summation or another mathematical calculation that results in one final reduction number value that is representative of the single key contained in the final key-value pair reduction results. In our example word counting map reduction, a key-value pair is not even required for the mapping stage. 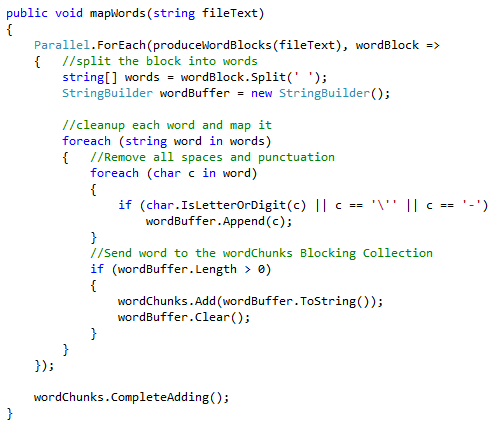 The wordChunks bag can contain any number of words (given your current memory constraint). These words can also be duplicates. Since we are only counting the occurrence of words, each word in our bag is considered to have a default frequency of 1. However, the ConcurrentBag could have just as easily been created as a collection of key-value pairs (ConcurrentBag<KeyValuePair<string,int>>), if needed. Map reduction processing provides an innovative approach to the rapid consumption of very large and complex data processing tasks. The C# language is also very well suited for map reduction processing. 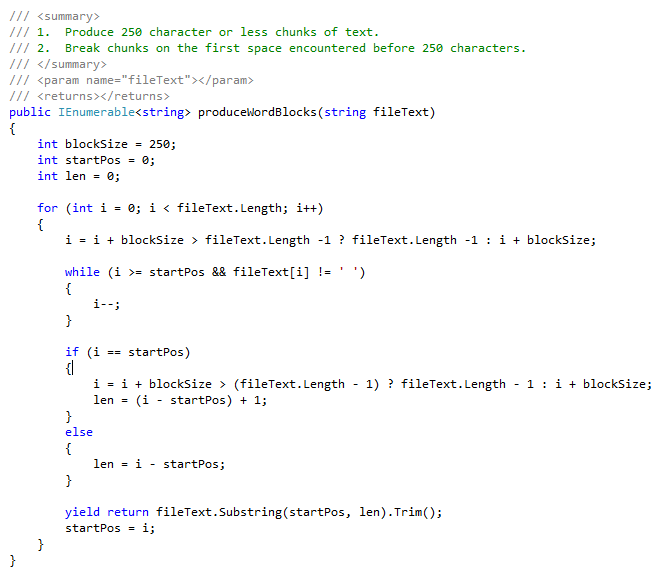 This type of processing is described by some in the C# community as a more complex form of producer / consumer pipelines. Typically, the largest potential constraint for any map reduction system is i/o. During map reduction processing, i/o should be avoided at all costs and used only for saving final map reduction results, if possible. When the processes described in this document are combined with data store sharding and map reduction partitioning processes, data processing tasks of most any size can be accommodated. If you actually read this far, I’m impressed. Thank you! Code examples from this project can be located here.